This year we decided that we would celebrate Christmas in a new way. We decided that our main gift to one another, and from our parents to us, would be a safari trip. We have all been looking forward to this trip since we began planning! Our friends, the Lawson family, also decided to join us in this adventure! Our Christmas trip is actually happening a bit before Christmas for several reasons. First, we want to be able to celebrate Christmas at Good Shepherd's Fold with the children and missionary families there. Secondly, I leave the day after Christmas for my trip to America for medical care for my tongue. And third, these were the dates we could find a place to stay at the park. 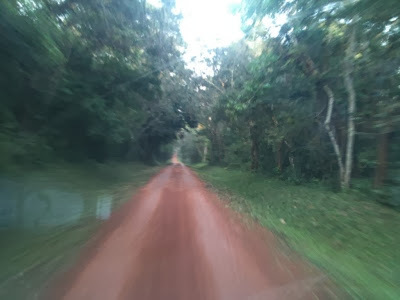 On Wednesday, we began our travel to Murchison Falls park in North-western Uganda. I drove in Kampala traffic for the first time, which feels like quite an accomplishment. Along the way we had a brief stop for grasshoppers for a snack, and then later for chicken, goat, and beef on a stick sold on the side of the road. We spent all day Friday driving, but the last 2 hours were in the park around dusk and it was awesome! We saw many baboons, Colobus monkeys, vervet monkeys, warthogs, fascinating birds, and a jackal! We arrived after dark, had a late dinner, then went to bed. 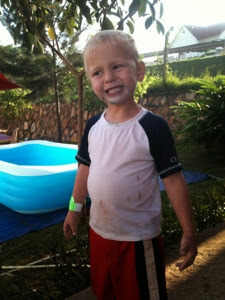 The next morning Elijah woke at 3:30am asking if it was time to get up for our safari. We had an early safari drive which was amazing. 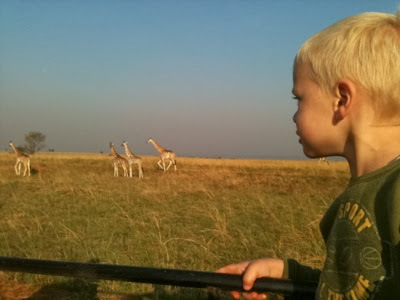 We saw many types of antelopes, warthogs, baboons, various birds and giraffes up close. We also saw some elephants in the distance. We enjoyed riding on the roof of our van to get a good view of all the animals. That afternoon we swam in the pool, ate lunch, and headed out for an afternoon boat ride 2:30-5:30 to see animals on the way to see Murchison Falls. It was so awesome! Hippos and crocodiles and fascinating birds galore. And we saw many elephants up close who had come to the river for food and water. I even saw a lion at a significant distance through the binoculars, although David doesn't believe it. ;) That night we had dinner and then enjoyed African music and dancing around a bonfire. We all joined in a bit. Then we all slept soundly! 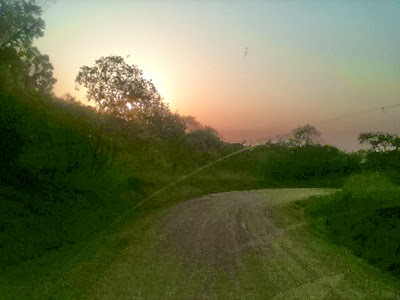 On Friday morning we got up early again for another morning safari drive. Honestly I was tired, Zeke was crying and I was thinking we should just stay in bed. But I am so very glad that we did not. 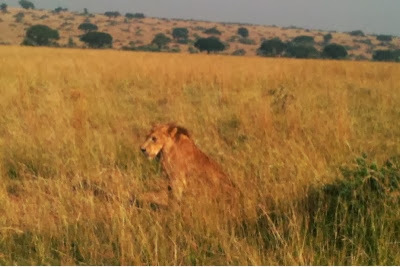 Our guide spotted a lion at quite a distance. After a bit we were able to see him much closer. It was a male lion who was probably about 5 years old. We got within about 20 yards. It was awesome! We also saw more elephants, giraffes and other animals on this drive. After this safari drive we went back to the lodge for lunch, then headed on to the Rhino sanctuary. Thankfully it is about a 3 hour drive so everyone (except David since he was driving) got a nap. :) the Rhino sanctuary is the only place rhinoceros live in the wild in Uganda. There are currently 13 rhinos, some of which are pregnant. 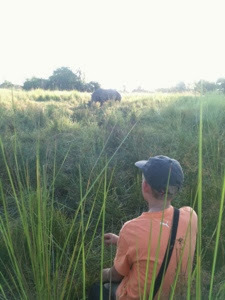 We went on a short walk through the grassland with our guide and walked very close to some white rhinos. It was so cool! 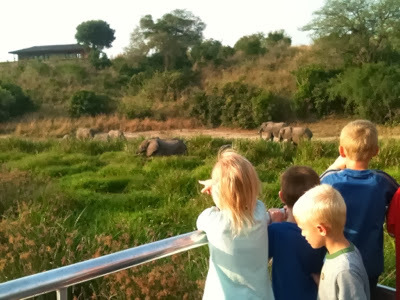 We spent the night in a guesthouse at the rhino sanctuary and saw more rhinos on the way to breakfast. After breakfast we prepared for the long drive home. In Kampala we stopped at a mall for lunch and for some things we can't get in Jinja. We found a new mall that has an awesome play area for kids. 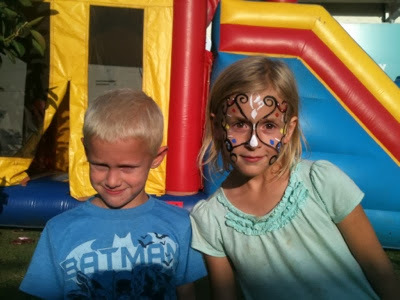 As you can see they had face painting and inflatables! They also had a small inflatable pool and cotton candy! While I took the younger three to this fun play place, David took Elijah to see "The Desolation of Smog." Tolkein is Elijah's favorite author. He loves the Hobbit and reading The Lord of the Rings with David. We will have a late drive back to GSF, but we have had a wonderful time! We are so thankful for such a fun family few days together for our Christmas trip! It is good to make these special memories particularly the week before we have to be apart for a month. Please thank God with us for this blessing for our family and also keep us all in your prayers for the month of January!